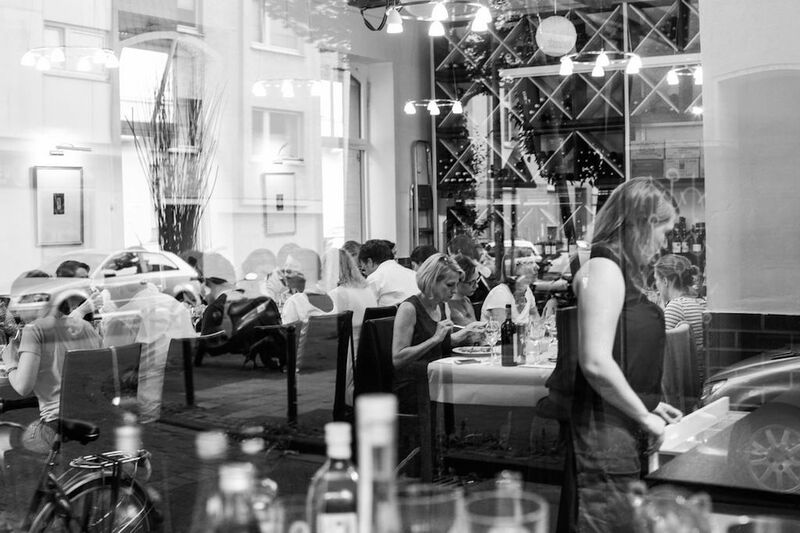 Last Friday, I took the cooking out of my home kitchen and joined my friends from the Frankfurt/Cologne based supper club Ceci n’est pas un restaurant for the wonderful Summer Of Supper event in Cologne. 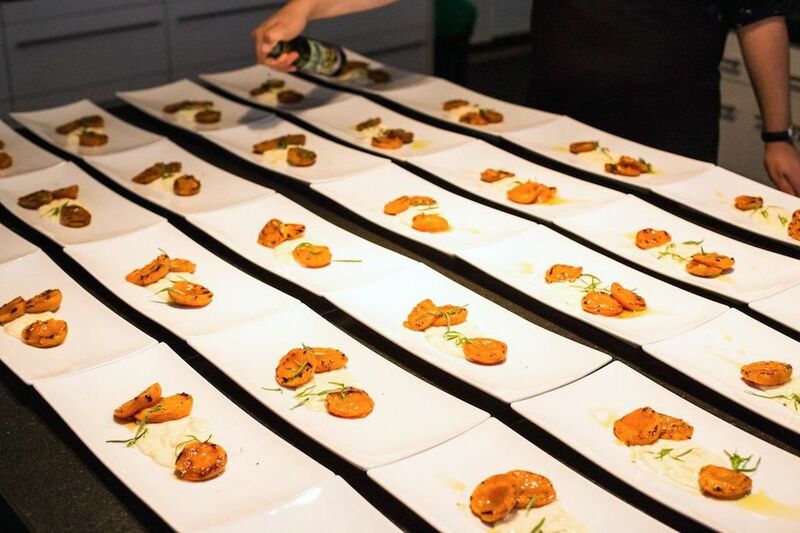 Six supper clubs (sort-of underground nonprofit pop-up restaurants run by ambitious amateur cooks) were invited to each host a dinner night for 30 people. We cooked a summer-celebration 5 course supper menu for a mixed and merry food loving crowd, and boy (or girl or other) – did we have a great time! To start the evening off, I made a dish based on my homemade Stracciatella cheese, which you should absolutely try and which I will tell you how to make below (where I will also tell you about a ‘hidden bonus track’ in the recipe…). 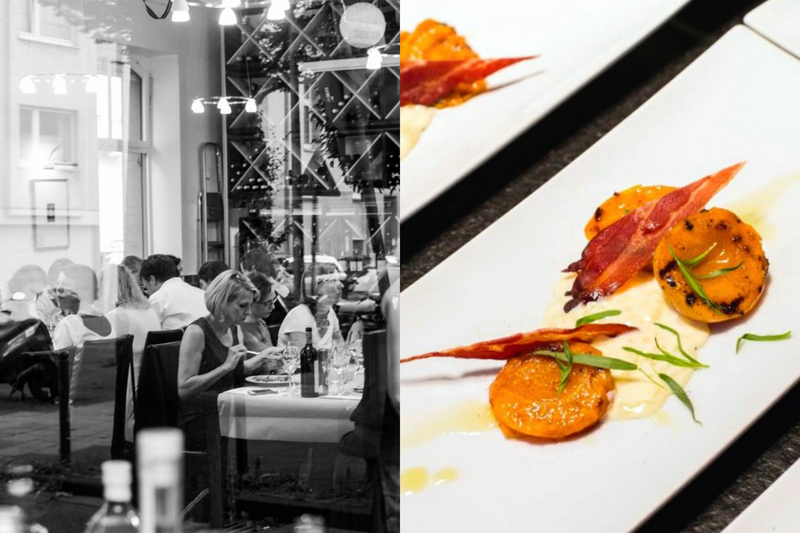 Summer Of Supper is an annual cooking extravaganza hosted by Marco and Torsten from the cooking school slash event venue Marieneck in Cologne-Ehrenfeld, which brings 3 weeks of food, drink, and … love to the city. It’s a beautiful corner-shop space with large windows, a fully and well-equipped open kitchen, and seating for up to 30 guests. Ideal conditions for us, who are used to cooking in much smaller kitchens and with a much more limited arsenal of tools. 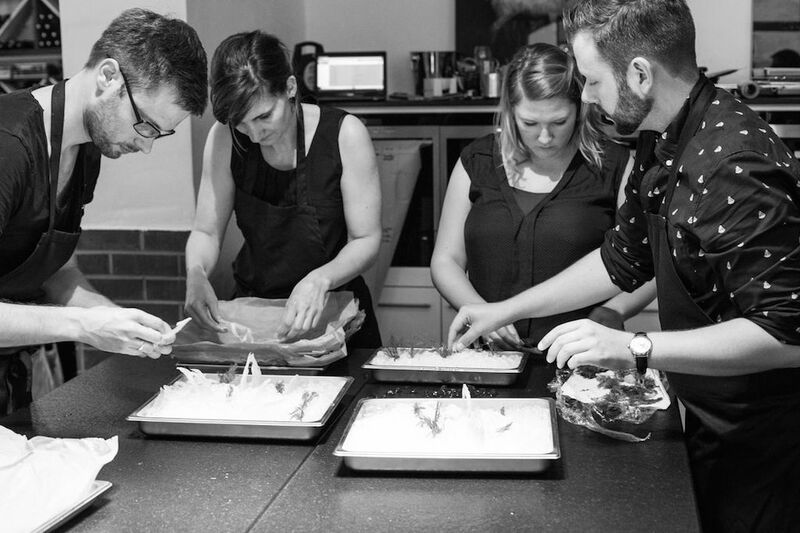 The event is all about celebrating the passion for cooking and sharing food in great company. And this is also what my friends Jette, Klaus, Björn and Anna do when they open the doors to their supper club Ceci n’est pas un restaurant every other month. 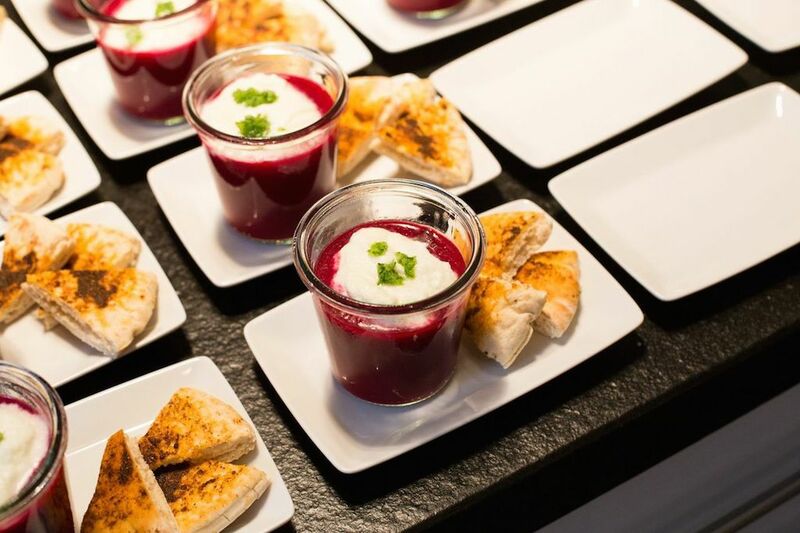 Their supper nights combine delicious cooking, lovely wine pairings and exciting venues (like the Frankfurt Opera or amidst the exhibition in an upscale furniture store) to provide a great food experience for around 10 people (mostly strangers, but meanwhile some returning guests and also friends). 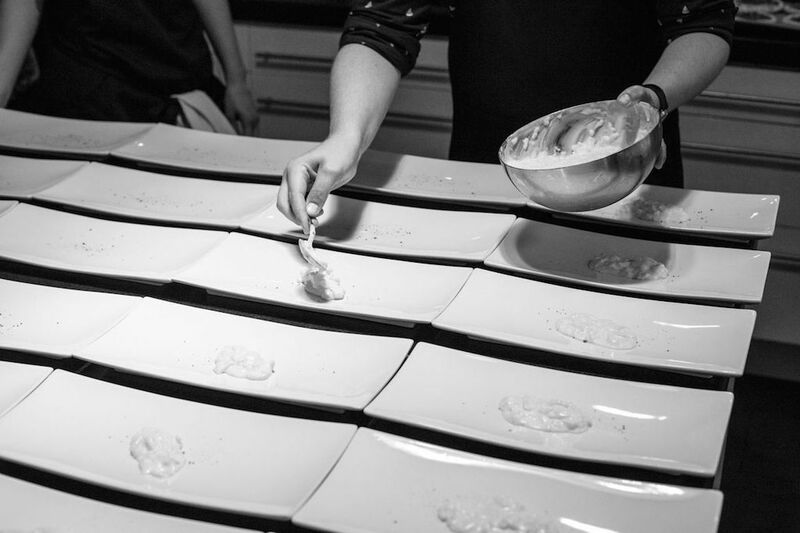 From the moment we set foot in the kitchen at Marieneck, we were excited for the guests to arrive later in the evening – and, to be honest, also a bit anxious, since none of us had ever cooked (and plated!) for 30 people. For Summer Of Supper, my friends asked me if I wanted to join forces with them, and I gladly did – the event seemed such a great idea, and the idea of cooking a dinner for 30 was really intriguing to me. We played around with ideas a few weeks and came up with a really nice concept for a summer menu, which takes the guests on a tour of the mediterranean in 5 courses. We served a cassis-colored beet root gazpacho with cucumber foam and a spicy pita bread, absolutely divine lamb cutlets on creamy polenta with roasted and fried garlic and roasted veggies, and finished the meal with an extravagant weird-but-wonderful cassata ice cream with white chocolate and kalamata olives on a sweet cherry tomato compote. 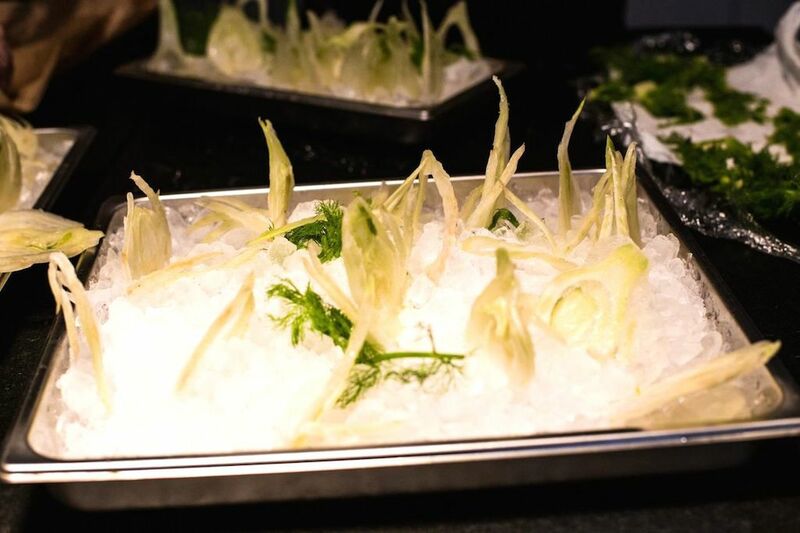 A simple highlight was flash-frozen raw fennel shavings in vanilla and citrus syrup, which we served as a palette cleanser before the main course. When it came to my own contribution to the evening, I went with my usual instincts about summer cooking and eating: in summer, I want simple food, rather assembled dishes than overly complicated cooked ones, which highlight the natural clean flavors of their components. Stracciatella is an Italian cheese preparation from the Apulia region, that highlights the pure and ’round’ flavor of fresh milk, with no fuss added. It is basically shredded (Italian: stracciare = to tear, to shred) Mozzarella cheese that is steeped in cream, with only a little sea salt. You may know it as the gorgeously sumptuous inside of the now very trendy Burrata cheese, for which the Stracciatella is kept inside a case of Mozzarella. To me, it is all the goodness in fresh milk turned into greatness. I love its velvety rich texture and milky cool flavor, which I wanted to highlight in my Summer Of Supper starter: I paired it with the sweetness and smoky flavor of barbecued apricots and the herbal tang of fresh tarragon, topped of with the salty and meaty taste and bite of some crispy bacon. Unfortunately, Stracciatella is rather hard to get around where I live, so if I want to eat it, I have to make it myself – and I suggest so do you. To make your own Stracciatella, you first have to make a batch of Fior di Latte cheese. Don’t panic – this is just the fancy name for any Mozzarella not made from buffalo milk. If that still doesn’t sound too comforting – wait and see. It’s really not that complicated. Now there are dozens of Mozzarella recipes on the net, and also very good and detailed photo instructions on how to go about making it. As tempting as the thought of adding another detailed step by step description of the same thing to the dozens that already exist may seem (irony sign) – I will gladly refer you to those for the whole process side of things and just give you my measures and experiences. Mozzarella, when you make it at home and how I do it, has just three ingredients: fresh, raw cow’s milk, citric acid, and rennet, an enzyme found in and produced from calfs stomachs or, in a vegetarian version, from microbes. The latter two are easily available from any pharmacy or on the net. I use rennet in tablet form from the German firm Spinnrad. They are about 9 Euros per 12 tablets (enough for 12 litres of milk), citric acid comes in granulated form and is about 30 ct per 10 grams. Getting your hands on the main ingredient may be a bit of a challenge: actual fresh, raw cow’s milk, i.e. milk that has not been pasteurized or ultraheat-treated, is a very strictly controlled product, and has an extremely short shelf-life, so it cannot be held in stock and transported too far. If you don’t live near a farm, try your local organic food stores or Reformhaus. You need raw milk because the pasteurization process alters the protein structure in the milk, which will hinder the curds in the cheese making process to form (and Mozzarella is nothing but those curds). A quick run-through of the process may help you decide if you want to tackle it at all and carry on reading: You mix the milk with citric acid, heat the mixture up to 32 °C and stir in the rennet. After about 15 minutes the solids in the milk will have separated from the whey and will have formed a mass similar to silken tofu. You cut that up in squares, heat it to 43 °C, stir it, strain it. Now that the cheese curd is separated from the whey, the curds are heated in hot whey or water and then stretched, kneaded, and folded over and over, until they become glossy and smooth. Done. 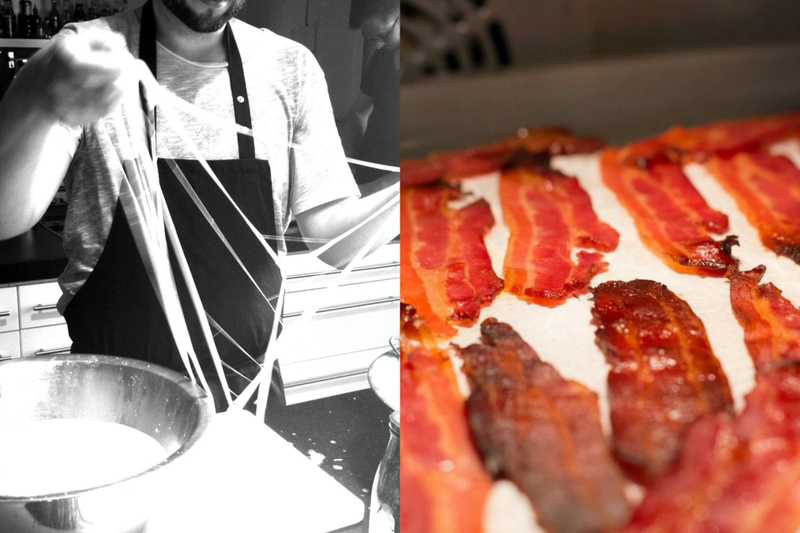 To make Stracciatella, instead of forming the Fior di Latte into balls, you rather form a “rope” shape and then go totally Spiderman on it, tearing the rope apart lengthwise with your fingertips over and over again, creating threads of mozzarella that way. Once you have made enough threads, twist them off and submerge them into good cream to which you have just added sea salt to taste. Make sure you only use salt with no additives like iodine, since this can mess with the lovely clear milk flavor and color of your cheese. The Stracciatella is best (in my opinion), when you give the finished cheese a few hours to set. The cheese threads will slightly dissolve at the edges and the cream will slightly thicken, and everything will turn into everything you ever wanted 2 litres of milk to be – AND more: in the whey that is leftover from the cheese making process, there is an added bonus delicacy hiding, which you can easily make at home: fresh Ricotta cheese. All you have to do is put the whey back on the stove, heat it up to 94 °C, so that the remaining solids in the whey can stabilize. Then you slowly ladle the whey through a colander with a cheese cloth or paper kitchen towel, and watch the goodness materialize. Enjoy the Stracciatella like we did at Summer Of Supper, or Caprese style with tomatoes and basil, put it on hot pasta, pizza – whatever calls for some gooey goodness. Eat it within 2 days max (it will be finished earlier, believe me). For illustrations of the work steps, I recommend Kristy Muccis description on Food 52. 1 mix the citric acid crystals and 60 ml of water in a cup and let the crystals dissolve completely. Crush the rennet tablet in a mortar and set aside. Then pour the milk in a non-reactive pot and add the citric acid solution by pouring it through a slotted spoon. Mix with a few slow movements of the spoon and and put it on the stove. Bring it to a temperature of 32 °C. While the milk is slowly heating, mix the rennet with 50 ml of cold water and let it dissolve. When the milk has reached 32 °C, pour in the rennet solution (again through the slotted spoon) and distribute it by pushing down the slotted spoon in the milk several times, for a count to 30. Then cover the pot and leave the whole thing stand for about 20 minutes. 2 In the container for the finished Stracciatella, mix the cream, mascarpone (which is not traditional, but I like it), and salt to taste. Set aside. When you open the pot after 20 minutes, the milk should have formed a wobbly mass resembling silken tofu, which you can pull away from the pots sides, seeing clear whey. If it’s still yoghurt-like, give it some more time. Once the curds have set, cut them into squares with a long-bladed knife that reaches the pot’s bottom. Then put the pot back on and heat up to 43 °C. The cutting and heating help the solids separate from the liquid whey. When the temperature is at 43 °C, use the slotted spoon to transfer everything into a colander over the bowl and let the whey drip off, collecting all the whey. When all the solids are removed, heat the remaining whey up to 80 °C (or as hot as your hands can handle – you can wear heat proof vinyl gloves as well). Take half of the curds and put them on the slotted spoon, then lower them into the hot whey and let them heat up for a moment, until they become gooey when you pull them. Hold the curds in your one hand and pull with the other hand, then fold them back together. Repeat until the curds are glossy and elastic. 3 Quickly drop the curds back in the whey and pull the ball into a rope shape. Then, using your fingertips, pull the cheese into threads. This video by cheese maker extraordinaire Rynn Caputo shows the process. For this process to work, the cheese must be stretched enough and warm enough. The good thing: if it’s not, you can easily fix it by stretching and kneading it more or just dropping it back into the hot whey for a few seconds. 4 Drop the threads directly into the cream you set aside earlier. Mix, and eat it right away or give it two hours or more to set. 5 If you want to serve the Stracciatella like I did at Summer Of Supper, halve the apricots and brush them with a bit of olive oil, then put them on a hot barbecue or griddle and grill until they have blackish marks and become tender. Let them cool off a bot, meanwhile crisping up the bacon in the oven or a pan (oven at 200 °C top and bottom heat, about 7 minutes, depending on how thick the cut is). Serve the Stracciatella with the apricots and bacon, strew with fresh tarragon (about 5 leaves per plate), drizzle with fresh olive oil and salt and pepper to taste (you can put the black pepper on the plate before you spoon on the stracciatella, that way omitting the black spots if you prefer it that way. Sounds fantastic! I would love it if I had something like that in this part of Germany where I live. Love the menu Tobi. So simple yet unbelievably stylish. Mmmm. Wish i could taste the food! Super interesting, Fior di latte is one of my favourite ice creams and I never knew this. I am so going to make this, thanks, N.